Every four years, coverage of the presidential election turns more into a horse-race story about who’s leading the polls and who said what when. Younger readers, who might be old enough to remember only one or two other elections, aren’t provided with much information about how the election process actually works, why it matters, or how they can become involved. With civics education becoming less common in schools, it’s important for teens to know what’s going on. 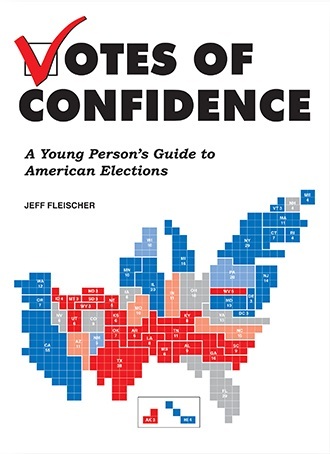 With the 2016 election promising to be an interesting and hotly contested one, Votes of Confidence will be a timely resource that can generate news coverage, while written in an evergreen way that can remain relevant after the next president is chosen. Using a fun, casual voice and interesting sidebars and anecdotes that tell stories rather than just list facts, this book will provide teachers with a supplemental resource and readers with an engaging way to better understand their government. The Book Cellar in Chicago’s Lincoln Square held a kickoff for the book on March 21, with a presentation and Q&A. Signature Reads asked me to write an article about things to know or watch in the 2016 election cycle. Newcity named the Votes of Confidence launch its #2 literary event for the May 16-30 issue. LitPick, which interviewed me for its Six Minutes with an Author interview series after my last book, added an Extra Credit interview for the new one. This Huffington Post article on how to talk to kids about the election cites the book as a resource and as source material. Medill Magazine included the book in its roundup of alumnni books for Fall 2016.